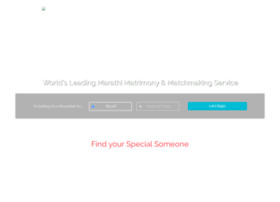 marathishaadi.com - Marathi Shaadi. Marathi Shaadi - The No.1 Marathi Matchmaking, Matrimony & Matrimonial Site. Registrant Organization: People Interactive (I) Pvt. Ltd.
Admin Organization: People Interactive (I) Pvt. Ltd.
Tech Organization: People Interactive (I) Pvt. Ltd.